Seeing as how I've never used it, I decided to download Arch Linux and see what it's all about. 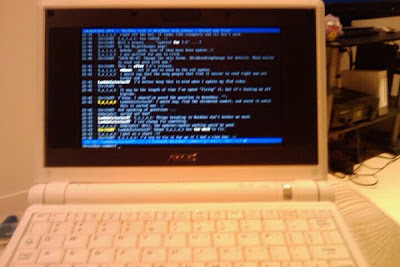 My test subject machine for Arch is an Asus Eee PC 2G Surf, with an 800 MHz Celeron CPU (underclocked to 571 MHz), 512MB RAM, and 2GB SSD. I downloaded the netinst ISO of the latest release (2010.05 at the time of this writing), burned to CD, and installed with minimal effort. The SSD was divvied up into a 50MB /boot partition, with the rest going to / and no swap setup; as this is an SSD a swap would be rather unnecessary. Gave / the ext2 filesystem and installed a base install with a few extra tools. Total install with just the core install was ~420MB. Most of the other tools and apps installed are the standard set of Linux tools, and I also installed the developer tools so I can compile some things from source. With kernel 2.6.34 and bash 4.0, the entire setup takes up a grand total of just over 1.1GB now. gentoo is a beauty as well! though i remembered it being a bit tricky to get on my eee at the time. i loved how arch had a specific kernel for the eee's.